Valves are linear-lanceolate and slightly dorsiventral, with broadly rostrate to capitate apices. Dorsal margins are slightly convex; ventral margins are nearly straight. The axial area, near the median line of the valve, is narrow at the valve ends and widens gradually to merge with a rounded central area of variable size. The central area ranges in size from about one-fifth to four-fifths of the valve width. The raphe is lateral, becoming filiform to reverse-lateral at the proximal ends. The proximal ends are weakly expanded and deflected towards the ventral margin. Terminal raphe fissures are deflected dorsally. Striae are radiate, more widely spaced near the valve center, and very finely punctate. Areolae are difficult to resolve in LM. 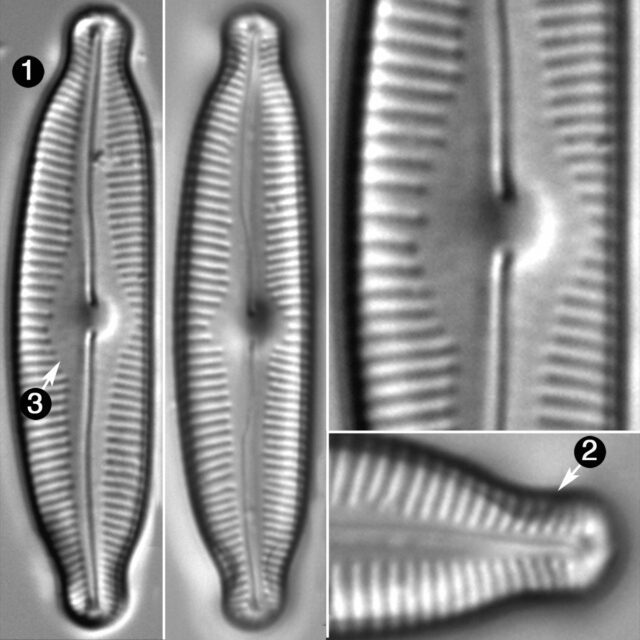 This taxon displays considerable variation within a population in length to width ratio, shape of the ends, width of the axial area and width of the central area. To prepare this taxon page, we compared populations in British Columbia, Saskatchewan, the north slope of Alaska, and Swedish Lapland, along with the iconotype image of Cymbella naviculiformis var. linearis Foged (=Cymbopleura linearis (Foged) Krammer). We conclude that C. linearis is a later, subjective synonym for C. fluminea Patrick and Freese. Patrick and Freese (1961) described conditions at the type locality as follows: "seepage over silt-gravel surface", pH 6.7, temperature 18C, alkalinity 16 ppm (as CaCO3), hardness 30 ppm (as CaCO3), chloride 25 ppm, total iron (Fe) 0.07 ppm. Krammer (2003) reports both C. fluminea and C. linearis from oligotrophic waters with low electrolyte content. 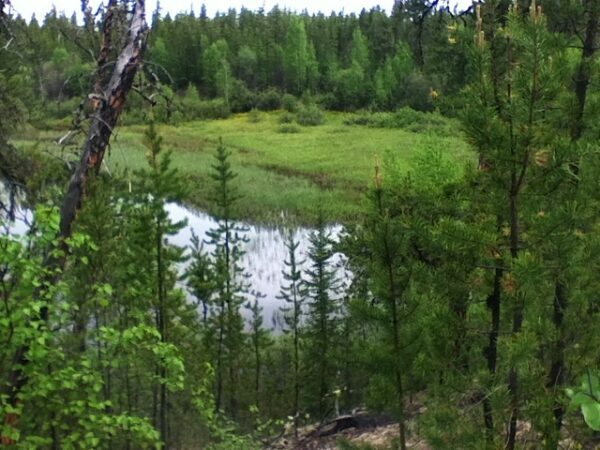 Besides several waters in Alaska, this species has also been reported from the subarctic region of Siberia (Lange-Bertalot and Genkal 1999), from Finnish and Swedish Lapland (Krammer 2003), and from a wet grassy meadow in northern Saskatchewan (photo below). Credit: Beverly Boynton, Adventurers and Scientists for Conservation. Wet grassy meadow near the Clearwater River in northern Saskatchewan, Canada: home of Cymbopleura fluminea. Valve with median raphe, but one margin is convex and the other is straight. Apices broadly rostrate. Axial area narrow, slightly widened into the central area. Central area small, linear. No isolated punctum or stigma present. Striae finely punctate, radiate. 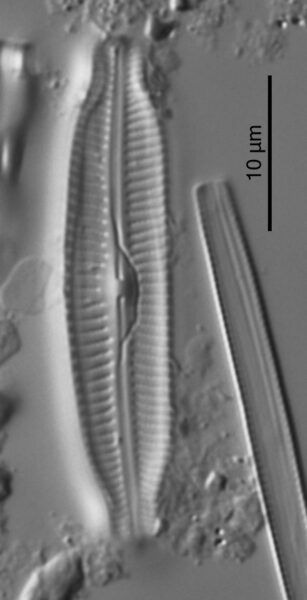 Striae 12-14 in 10 µ in the middle part of dorsal margin, 14-15 in 10 µ in middle part of ventral margin. On both sides of the raphe the striae to 18 in 10 µ at the apices. Length 34-40 µ. Breadth 6-8 µ. Valves are slightly dorsiventral and linear-lanceolate. Apices are broadly rostrate to capitate. The central area is rounded and variable in size.